Sarah-Mary Geissler, currently studying BA (hons) Fashion and Dress History, shares her experiences behind the scenes at Beamish: The Living Museum of the North. Before embarking upon the Fashion and Dress History course at Brighton I wanted to seek out relevant experience in the field. I came to Brighton as a direct-entry second year student and had previously completed a year of a Fashion Design degree but was concerned it may be difficult to transition from making clothes to analysing them, so for 8 months I volunteered once a week at the Living Museum of the North; Beamish. 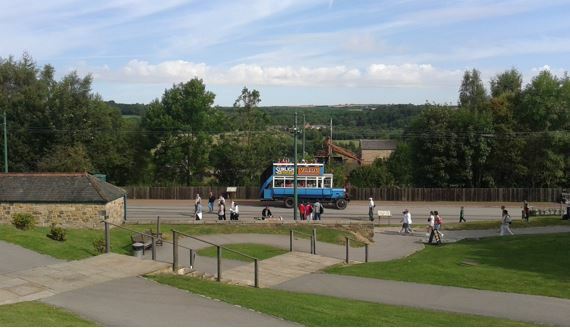 I had visited Beamish often before, the open air museum is a school-trip staple of every north-eastern child. Visiting as an adult I still felt totally absorbed by the experience: the exhibits aren’t restricted behind glass panels in temperature controlled rooms, rather everything is laid out awaiting interaction. 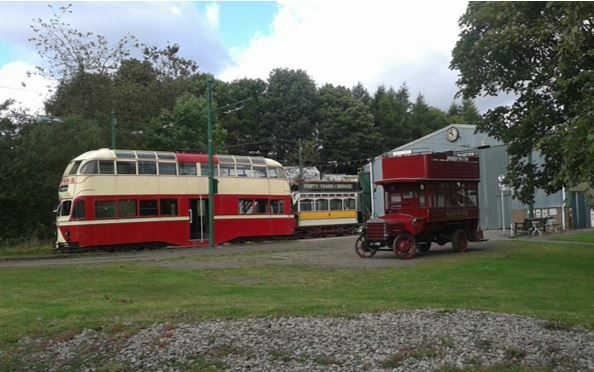 The grounds are divided into 7 distinct period areas, the earliest an 1820s farmer’s house and most recent the 1940s wartime home farm, all linked by restored trams and buses. I was elated when my volunteer application was accepted! Based upon my sewing experience, they started me off working in the Costume Department. 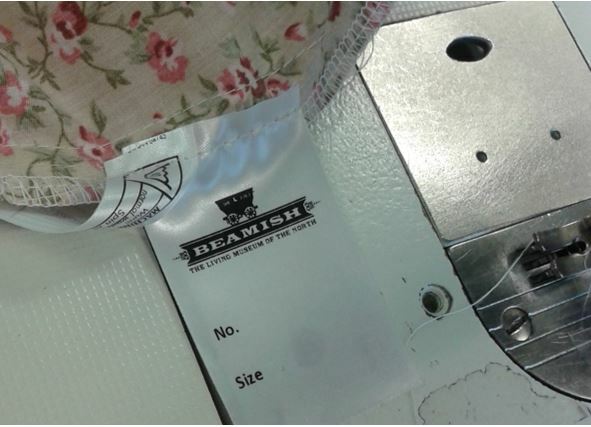 An onsite sewing room is an absolute necessity in such huge attraction; Beamish has around 400 costumed staff and volunteers, most of whom work between different areas and so require 3-4 period costumes each. On top of this there were always different projects popping up, from making oilcloth table covers and floral curtains to Boy Scout neckerchiefs or nurse’s aprons; we were certainly never short of work. Inside the sewing room were photocopied images pinned to every wall, a large bookcase stood in one corner filled with texts on costume and period fashion and another corner housed large filing cabinets of dress patterns, a mix of store-bought contemporary clothing patterns and specialty costume patterns sourced online, all to keep a strong sense of each era’s shapes and silhouettes. Reproducing the periods accurately is a key priority of the museum as the visitors range from young children using Beamish as an educational resource to history buffs who are all too eager to point out historical inaccuracies. 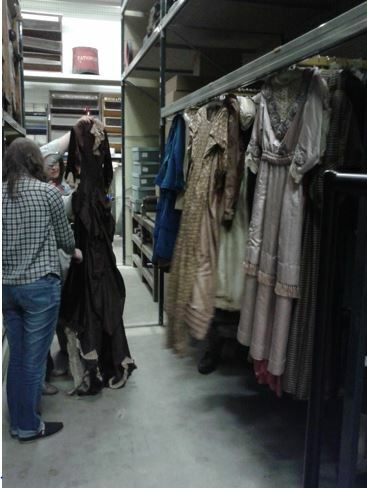 When the curatorial team gave me the opportunity to explore the clothing archives I was thrilled! 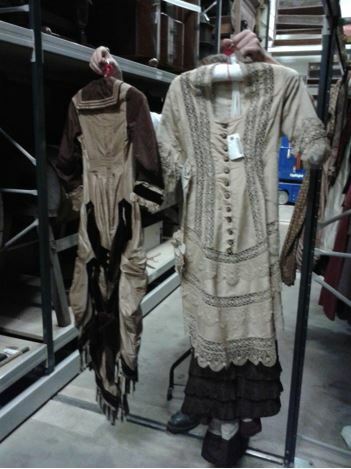 There is an expansive collection of period clothing hidden in the archives, mostly accredited to a previous curator with a personal interest in textiles. Due to the fragility of the garments and the nature of the museum, there is no way to wear these garments or display them effectively, which is a shame as there are some remarkable pieces. For a living museum it is important to collect pieces reflecting various walks of life, so within the archives was a 1980s coal miner donkey-jacket as well a fascinating 1940s wedding dress with matching gas mask. 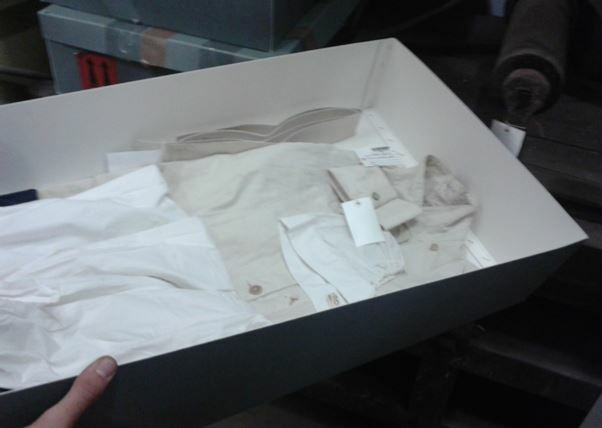 Also stored were many pieces of 19th century servants’ uniforms and other examples of workwear, garments that rarely survive past their original usage. The earliest items of clothing are late 18th century while the earliest shoes dated back to around the 17th. A large number of gowns from Victorian society women were kept, worn fairly little and preserved very well. Certain pieces came with a full biography of the previous owner whereas others remained a mystery. Interestingly, it was possible to discern when gowns had been altered or re-made according to trends, we actually found two dresses which had been cut from one original gown. There were various wedding dresses and mourning clothes dating throughout the Victorian era up to WWII Utility wear. The collection becomes sparse from 1950s items onwards, mainly because these more recent items now have value in the vintage clothing market and are no longer donated freely; however, there was a delightful 1960s Biba minidress hiding behind the gowns. Beamish has a sentimental value to many and often people will bequeath their possessions to the museum, leaving them to someday represent their era to future generations. Currently the museum is preparing a 1950s Pit Village area, so towards the end of my time at the museum there was an influx of 1950s items and furniture. It falls to the curatorial team to decide what is kept for future use within the museum and what is archived, one difficult decision I witnessed revolved around 3 packs of genuine 1990s Safeway brand toilet rolls. 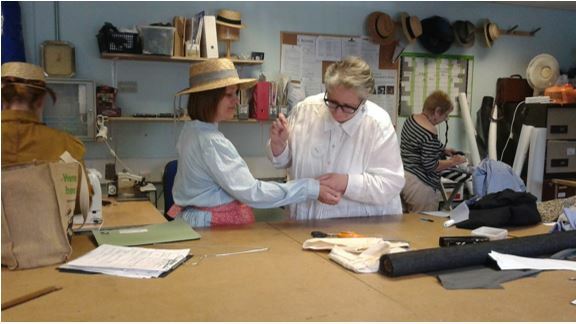 Volunteering at the Beamish museum was an enlightening look behind the scenes at how a museum operates, not only did it strengthen my dressmaking skills but I had the opportunity to learn about period clothing, how garments were made and how people would have valued their clothes. The experience has led me to rethink what I thought defines an era, the importance of living memory in the understanding of history, and to consider what we would choose now to represent the present to future generations.